New from Wavemakers is the 858 Series Mixing Systems. 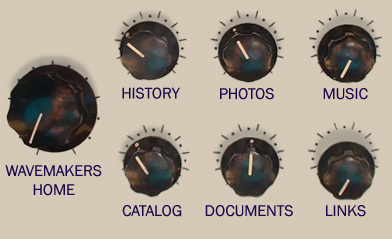 Featured are four main output assign switches with L/R manual pan control as well as three process busses with individual send-level controls and a switched solo bus. Each channel is also terminated before and after E.Q. on the rear panel. Three effect returns are independently switchable to any of the output channels and can be used to mix line level inputs into the final output. Also featured are voltage controllable input channel gain, and 3-band E.Q. per channel (7-band output channel E.Q. optional). Optional subsystems include the 447 output system which includes expansion and limiting for noise reduction of inputs, 5 step LED peak indicators for each channel, a joystick and master output remote control. The system can be packaged to have input gain control at slave stations for each performer as well as timbre and placement. Contact Wavemakers, P.O. Box 27, Edmonds, WA 98020.